and so i'll try a cuff for each wrist, one in the 2-needle and one in the 3-needle. and document it maybe if i do it. oh yes please!! and if putting pics online is to much of a hassle because of the slow connection, you can send them to me, if that makes things any easier? looking forward to seeing the experiment! That is a luscious color, Bess. It looks pretty nearly done too. indeed. only it is much more boring. :duuuh: bess, i understood up until 'make holes along the last row' sometimes i think i am SOOOOOOO thick! they are eyelets, or just 'holes' *yarn over the needle, knit two together* repeat across the row, when folded this gives a 'picot' edge, or on something else such as a baby hat, a ribbon can be threaded through. 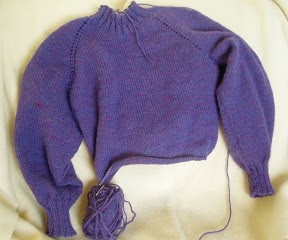 the yarn over makes a stitch (you swing it from the back of the needle to the front, on the knitter's side, in knit terms, 'as if to purl' ), the knit 2 together reduces a stitch and the space in between is the intentional hole. Shades of my Grandma....raglan sleeves.